Time for the first hive inspections of 2017. One has already swarmed so I know at least one made it through winter strong. Now it's time to find out how the rest fared. There was a lot to see with strong buildup already happening, mold caused by standing ground water, and finding queen cells to determine who swarmed. The moldy hive didn't let the damp conditions interfere, and spent much of their time building extra comb in the top. Even the swarm had built 3-4 frames in a week. These girls are hard workers! It was much more than a typical afternoon of communing with the bees. We had free labor visitors interested in learning about bees, and using that knowledge to mange their own hives. Hannah and Erica worked through several hives checking, cleaning, looking for queens, and listening to me ramble about bees. They even picked up my train of thought when I'd be talking, venture off to something else (SQUIRREL! ), then come back around like I hadn't been down a rabbit trail for a few minutes. The bees will be lucky to have them as their keepers! Hannah is 15, but handled herself like a seasoned beekeeper. She dove right in working the hives thoroughly while respecting the girls and not harming them. Mom was right there to assist the budding beekeeper, and both were exceptionally brave for their first time in a hive. I was impressed how calm they were. I remember how nervous and shaky I was my first time working with bees. Ok, I was terrified! Oh the poor girls I squished my first few tries. During much of this my usual helper napped quietly in a chair near the hives. He did do a good job documenting our labors in between naps and occasionally directing our activities. That last part went about as well as the time he opened a hive without proper gear. I even made him stop and witness as I said "here it is, the beekeeper is putting her bee boot down, watch, here it goes, it's down, and that's what we're doing!" I'm excited for Hannah and Erica to join me again. There's a lot that'll start happening as spring warms up and the honey flow starts. Plus there's the benefit of six hands to squish hive beetles. Bee activity is fascinating to watch and sharing it makes the rewards even sweeter! It's winter in Virginia. That would typically mean cold temps, wind, and all around avoidance of outdoors. This year has been warmer, wetter, and has allowed for bees to venture outside the hive for several days. I can't get home from work in time to see that, but Lynn does an amazing job of sending me videos when he can! Meanwhile I've found bee activities, other than hive inspections, to engage in. First on the list is mead making! I began dropping hints in September, giving specific details in October, and ordered the kit for Santa in November. Oh boy....it was under the tree Christmas morning! After lunch and family fun I set out on my first mead making adventure. Much like my other first time experiences this had mediocre results. Anytime I reduce a recipe it goes awry if I don't write it down. It's okay, because I know myself well, and compensate. That means NO I didn't write it down, realized my error 90% of the way through, then crossed my fingers and hoped what I did to fix it worked. It didn't. I know, shocking! I also know that if I take notes after failures I tend to not repeat them. I did take notes and embarked on more mead making. It's a hobby that stresses me, and has yet to provide a sense of accomplishment. I'll know more in a month. Since I have no mead goodness to show you I'll share my feeding experience. January temps are well above average. The girls can fly every couple days. They all had a full deep of honey going into the winter, but I'm worried about one that feels light so I made a spacer to hold fondant. 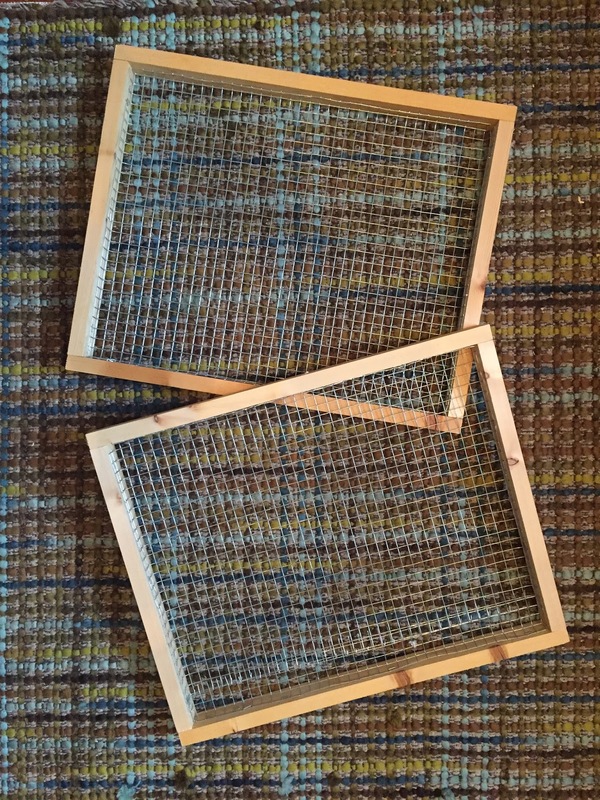 The process was similar to the top bar frame but for a Langstroth it fits between the deep and inner cover. After creating a small spacer to sit flush on the top box I lined it with hardware mesh to hold the fondant. 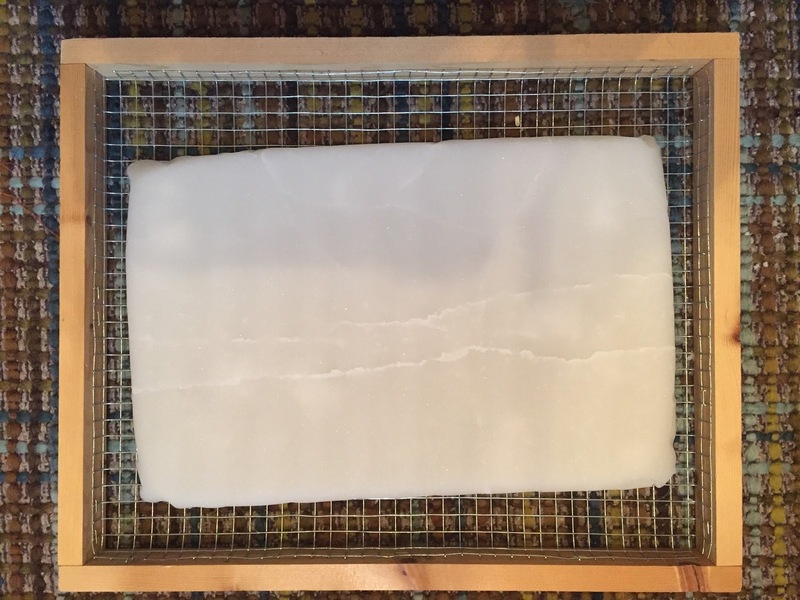 I used the same fondant recipe as my top bar frame, it's from the book The Thinking Beekeeper. I poured it out in baking pans then transferred it over. I added some pollen substitute to one end and quickly set it on the light hive during a warm day. Not quick enough though. They flew out to attack to make it clear they didn't like the mid-winter disturbance. Maybe they'll change their mind about my intentions when they aren't starving to death when winter finally sticks around. I'm not sure how they managed to go through so much honey compared to the other hives, but hopefully this will hold them over until spring. It's the time of year where I tuck the girls in for their winter down time. That means one last inspection of each hive to make sure everything looks okay and there's enough food for the winter. Putting in bottom boards, assuring adequate ventilation by propping up the cover, and adding insulation around the top bar. I don't insulate the Langstroth hives. During the last inspection I noticed two hives had bees that appeared to have deformed wing virus. I was surprised because I had tested for varroa and had low mite counts in all the hives. I treated both immediately. Well, as immediate as you can when your internet order hasn't shipped after a week, and the somewhat "local" shop isn't open on weekends. Fortunately October weather was warmer than usual so Mite Away Quick Strips could be used that late in the season. Young bee with deformed wings. Mite Away seemed to work well. A month after treatment all seemed active, had new brood taking orientation flights, and were no longer showing signs of DWV. I'll only know if was too late once I see how they fair over the winter. Only the top bar seems light on stores so I've made a frame to feed fondant. With each building project I set out with the best of intentions. I pore over plans and evaluate materials like a fine furniture builder. By completion I'm more like a first grader gluing together popsicle sticks. This finished product is somewhere in between. It's a good fit for the hive, holds a lot of fondant, and may last several years if treated well. One of those times where if others didn't know the original plan they wouldn't know it was messed up! The assembled frame ready for fondant. After assembly I prepared a fondant recipe and spread it in the frame. 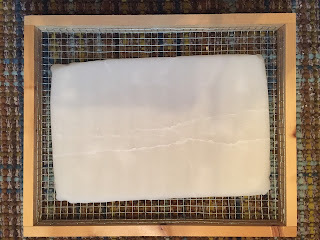 I turned a baking sheet over, covered it with wax paper, and laid the frame on it to provide a flush surface for filling. This was my first experience making fondant for bees. My only suggestion is don't over whip. I did and it hardened fast. Nothing that a bread knife couldn't trim! Finished frame with hardware mesh stapled in place to prevent the fondant from falling out. I feel somewhat lost now that the cold weather is here. Time to focus on other projects in the off months. 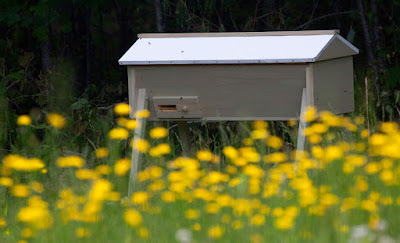 Purchase new boxes and frames during black Friday sales, plan to assemble them when the weather is too cold for any outdoor fun, and prep for Santa's deliveries that are bee related. Plus there's the chance to use my beeswax and honey to make "stuff." You may remember my previous post about my experience with broken top bar combs and repair using string to tie the comb up for the bees to reattach. It was successful even if somewhat difficult and tedious for one person. So when I found cross combing after a growth spurt I scoured the internet for other options. Thank goodness for people that share information! I found The Garden Academy's instructions about rescue frames here www.thegardenacademy.com/micro-homesteading/rescue-frames-fast-comb-repair/ Talk about a great idea! There were four bars that had been cross combed together on one end. A couple inches of curve at the end that moved over to the next bar. Plus another bar with double comb attached. When trying to remove one bar two other would either move with it or comb would break off of two in chunks. it attached to the bar next to it. I had to improvise based on the hardware mesh I could find locally, and used 1/2"x1/2". For the hooks that slid in I cut out the last row of cross wire so it would be 1" long to insert into the comb. Since most know patience isn't one of my virtues, there was a slight modification of the above referenced rescue frames. Mainly I didn't score the edges of my bars. Not only because of lack of time/patience/tools, I also planned to not leave the metal pieces in the hive. The result was a slight gap between bars. Not wanting other critters to use that as an entrance I sealed it up with duct tape. Ripping duct tape in beekeeping gloves........don't do it if you don't have too. The up side was anything that did try to enter was stuck to the tape. I won't embarrass myself by sharing a picture of what it looked like after it was taped shut. A few bars in place after attaching the mesh. Fast forward two weeks and I have SUCCESS. Beautiful straight comb attached firmly to bars. I removed most of the wire. One was still in progress and another was too embedded to remove without additional tools. I returned for both the following week. You can see in the first picture how some wax came out with the wire. The second picture is a new bar with straight comb that was started after the rescue frames were used. Removing the wire after a few weeks. Some wax and honey came with it but the girls made repairs quickly. Straight comb built on the middle of the bar! The weather continues its stray from the norm with the dog days of summer arriving early and lasting most of July. August offered a break from the heat with fluctuating temps. 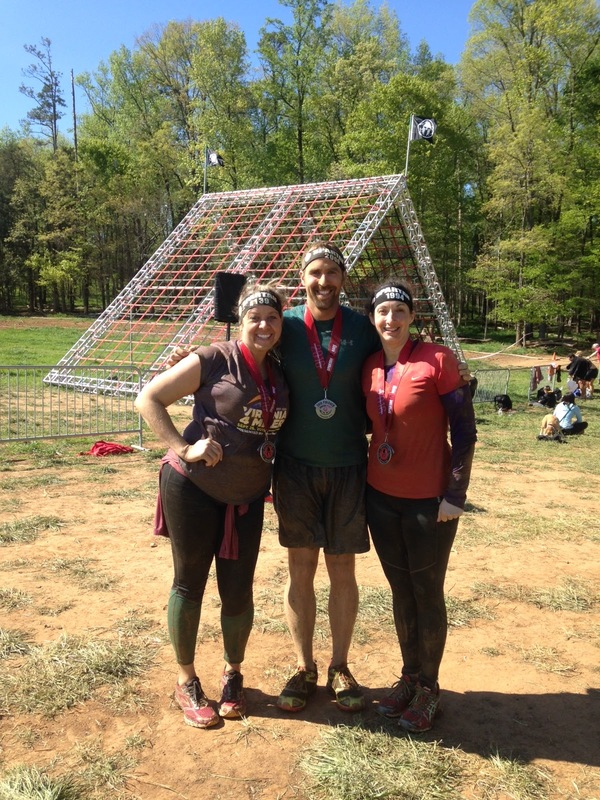 The girls worked hard through it. They were on the front porch fanning air into the hives during the day then even more piled out to beard during the evening. During the hot weather I learned top bars slow down comb building when it's really hot. They're picking back up as the nights get cooler. In addition to the bees we have several fur babies around our house. Two dogs and two cats. Daisy and Jasmine are our dogs. The past couple months they've taken an interest in beekeeping. Specifically walking to the hives with me twice a day. They wait patiently watching me do my work then head back when I'm done. Well, patiently if it's 5 minutes or less. They're off to play if it's longer than that. Jasmine's interest isn't new when it comes to anything that flies. For years it's been her personal mission to eradicate any bees from our back yard by chasing and eating them. Fortunately bees are fast and she's large and black so they often see her coming. She's also a master at sampling food from nature. She's equal opportunity when it come to snacking on grass, veggie plants in the garden, trying to pull peaches off trees, or the apparently delicious rose of Sharon bushes. We have to be careful what's planted inside the fence and googling "can dogs eat _______?" sometimes happens more than I like. Post honey clean up was no exception. I put all the supers in the basement for propolis to harden and began scraping it off before storage. Don't try removing propolis when it's warm. Big gooey mess! Propolis is something like bee glue. They use it throughout the hive to seal cracks, prevent movement of frames, build jails for pests, and much more. Scraping was easy once it hardened and I had a nice sized pile when Daisy wanted a potty break. When we came back in Jasmine was smiling and half the propolis was gone. Fortunately Dr. Google revealed to us that many bee products that are good for humans are also good for dogs. Google "can dogs eat propolis" for an interesting read how propolis, honey and venom therapy benefits pups. Next year I look forward to collecting propolis in addition to honey. Jasmine's snack led me to reading that reminded me honey bees aren't a one product wonder. I installed a package in the top bar April 26th. 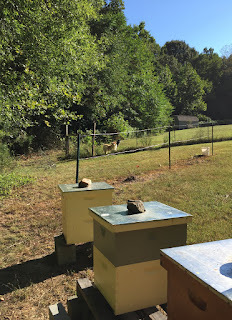 I picked up the package after work, wheeled the top bar down to the site (literally wheeled the entire hive balanced on top of the wagon), and set about getting the bees ready for their new home. First I had to level the hive to ensure bees didn't build comb at the wrong angle. The flowers in the picture below hide the tacky mix of wood pieces and brick I used to reach plumb. Next I inserted a follower board that included a built in feeder that we made. Lastly the queen cage was attached to a bar via staple, and the bees poured into the empty hive. Top bar hive. There are entrances on both sides at opposite ends. The new package only has access to one until they expand. I enjoy working in the top bar. It's easy to check syrup levels and the bees are significantly calmer than our Langstroth hives. Even when I have my big oops moments they are calmer, and I typically don't need a smoker for an inspection. There was a small amount of cross combing and it was easy to remedy since the hive was just getting started. Except for one bar that they built slightly wide, but the comb was four sided. Pretty much two rows of narrower comb hanging from one bar. At first it looked like they were going to pull the two together so I let them be. After a month they've expanded the comb instead of combining it. Here's where I made the BIG oops, my biggest yet. I made the mistake of turning the bar over. It folded open like a book and both pieces landed on the ground. Thank you, thank you, it's an honor to once again receive the Worst Beekeeper Ever award! The two pieces that fell apart. Expletives were uttered. I doubt bees can blush, but they probably wanted to. I stood there debating between several fixes while trying not to cry. There was enough brood in the comb that I had to place it back in the hive. If it had been honey I would have kept it out. It's still early and the hive is building fast with little syrup use. For the first week I propped it against the end of the hive and used sticks to keep space between the two pieces and the end wall. My thought was the brood would emerge and any pollen and honey would be moved to other comb. The queen was on one of the broken pieces. I found her on the ground while scooping up the bees to place them back in the hive. Was she hurt? Did I do something to damage her? No way of knowing without waiting for time to pass. Inspection a week later was disappointing because they were building the two pieces together and upward to attach to a bar. Definitely Italian honey bees with an appreciation for the leaning Tower of Pisa. On to the next fix. 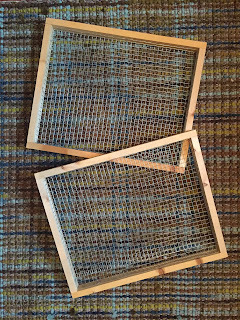 I separated the two combs and used cloth loops to "hang" the comb from bars. This way the bees could reattach the comb to the bar and chew up the cloth to dispose it. One of the pieces had three queen cells. Two were capped. I couldn't see into the third. I checked the remainder of the hive and didn't see the queen, but she could have been on the wall. I know I'd hide after her last experience with me. There are eggs, and they appear 2-3 days old. I added two more empty bars and based on this detailed document I think they're supercedure cells and not swarming: http://www.wbka.com/wp-content/uploads/2013/06/There-Are-Queen-Cells-In-My-Hive-WBKA-WAG.pdf Now I wait again. Another week has flown by and I anxiously headed to the hives. It's Father's Day! So of course I talked my dad into joining me. I'd say after having to suit up, and sweat like crazy in tyvek, he wasn't as happy as I was when done. I'm happy because the girls have reattached both broken combs to bars, chewed away the cloth so I could remove it, begun building on two new bars, I saw eggs, and I found the queen! They definitely didn't swarm. I feel awful I must have hurt the last one which definitely isn't why I decided to keep bees. Unseasonable weather started in February. Days were mild like spring, and I welcomed them because the bees were able to take cleansing flights. By March Mother Nature appeared to be quite confused. It rained and rained like April had arrived. The rain brought warm temps and the weather forecast showed no signs of things cooling off. Near the end of the month I took advantage of the warm temps and reversed the boxes on the hive. Two weeks later below average temps moved in and I had to wait an extra week to reverse the boxes back. Darn you Weather Channel! 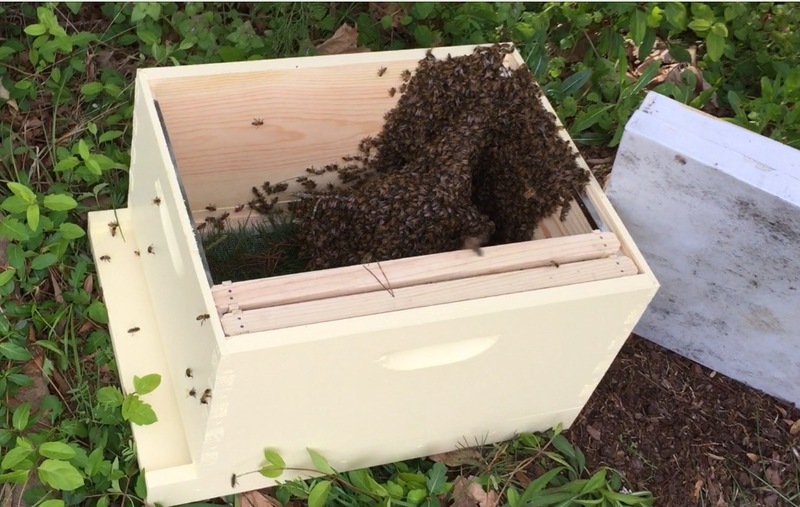 Of course the bees were unhappy with their current box positions and swarmed. The bad luck when a hive swarms is a smaller honey production, if any, and half the bees just left the hive. The good luck is I decided to walk near the hive when this happened. Imagine it's a beautiful Sunday afternoon. It's late in the day and the sun is shining. It's the day after Lynn and I completed a Spartan Race with our buddy Michelle. I'm lurching about the house in my pajamas while my muscles protest each step. I consider some outside time may make me feel better. I convinced Lynn it was a good idea and out the door we went, me still in my pajamas. Yes I meander around outdoors in my pajamas more frequently then you might imagine. Thankfully I live in the country, and was not walking down a city sidewalk in polka dot fleece. When nearing the hive I saw the swarm a couple feet off the ground and 20ft from their old home. The swarm is hanging from a branch all the way to the ground. Now I'm a frantic woman running around the yard in polka dot fleece, and non-matching green polka dot rain boots. I do hope neighbors don't drive by at moments like that. Oh it hurts to run, but I have to run because the bees are actively searching for their new home and they won't be staying around more than a couple hours. Not knowing how long they've been there I rushed to get pieces for a new hive together and in place. It's a mix of what do I do, where did I put that, throwing items at Lynn, and lots of repeating oh crap. After placing the branch in the hive. I cut the branch the swarm landed on and placed it in their new hive with a couple frames inside. I shook most of the bees off the branch, and brushed the remainder in. After the branch was out I put in the remaining frames. The hive was on the ground, and the bees on the ground started marching inside. After the marching was over we placed the hive on a stand in the same area. All of that sounds like I got my wits about me and the process went smoothly. That is misleading. There was a lot of asking what should I do now while constantly and loudly reminding Lynn to get back he might get stung. He likes to remind me he was wearing a full bee suit. I just reassure him it was because I love him so much and worry since he's allergic! This was the first swarm we'd seen in person or caught. It was exciting. Next time will go smoother, and we hope we get to do this again. My name is Andrea and I enjoy beekeeping with my husband Lynn. 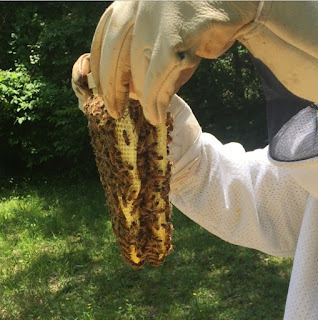 A coworker suggested I start a blog after hearing the crazy stories about our beekeeping adventures and the random facts I share about honeybees. Here I am. Hoping to share a few laughs and resources that have helped me on my beekeeping journey.